I drove over to the nearest Outback Steakhouse for dinner and noticed a Conway truck parked in back, so I parked next to them. When I walked up to the building just before opening, I met Larry and Nancy who drive team for Conway and we had a pleasant dinner together. Many of the things particular to CFI haven’t been explained well to our new Conway folks… for instance, getting home for Christmas, the Christmas bonus, firing a fleet manager, who to talk to if you are having problems with someone, etc. Also, the way our satellite communications works (with many individual messages) is quite alien to their experience and somewhat exasperating. 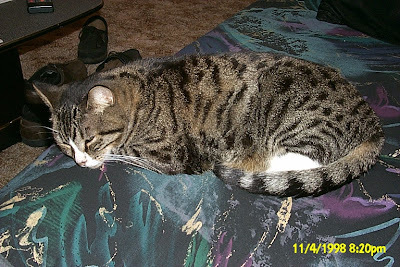 Mala was the most people-friendly cat I’ve ever known… slept under the covers with me almost every night and loved to be around people. She died in 2000 and I miss her still. I am commanded to turn south and take a load from our Lancaster, Texas terminal up to Joplin for my home time. Due to the delay between getting unloaded and being dispatched I would have just enough time to rush to Joplin before my 14 hour clock expired, assuming no delays. However, the load has been here for a while and doesn’t need to deliver until Monday, November 5th, up in Ohio so local dispatch will let me run it tomorrow. This has the salutary effect of giving me time to do laundry, take a nice long shower, go grab a steak and relax then head out first thing in the morning. Oh, it also means my home time won’t “officially” start until Friday which saves me a day… not like I need an extra one though. This morning over 1,300 packages were offloaded between the two stops I made. I watched most of the second unload and out of the 770 or so they got, less than 10% didn’t have “Made in China” stamped on the box. This isn’t unique to Linens & Things: it was the same when I did those Michael’s stores a few months ago. I’m not a huge rah-rah “buy American or else” type guy but it is a bit unsettling to see the gigantic flows of products from outside our borders, through local stores then into homes across our nation. Anyway, I’m empty now and waiting for my next dispatch. I couldn’t stand running my truck all last night so I took a chance and went five hours off, then started around 0100 for an hour, then left it off until my first unload. I can’t wait until they fix my battery issue and, eventually, I get an APU on the truck that I drive. The first map shows the simple drive up a designated state route (highway 289) between my first and second stops. No toll roads, no deviations, no problem. The second map, which we will call the “legal route” involves the north Dallas toll road, a couple deviations from the most efficient path and lots more traffic. So I have to make a tight left turn from a busy street on to a side street running behind my consignee and there is a lone male in one of the many sports cars in the area waiting to cross the street from my left. Because of the tightness of my turn, he is forced to adjust his schedule by at least 15 but no more than 20 seconds and back up about a car’s length so I don’t run him over, as I wait patiently in said busy intersection. He manages to accomplish this driving feat on the second try and as I’m carefully watching my trailer swing to ensure his car, and life, remain intact he rolls down his window and gives me the universal signal that I am #1 to him. If I was half my age and one-third my IQ I would have set my brakes and kicked him up a notch. Then, I make it into the parking lot behind my designated Linens and Things store and here is another punk in a grey mustang (not the classic, the lame new one they came up with) who is unhappy my backing maneuver is costing him precious seconds. He revs up his obviously-unmuffled beater engine over and over to show me who’s boss. With that many distractions so quickly, he’s lucky I didn’t inadvertently slip into the wrong gear and put a ding in his hood. Anyway, I made it, I’m backed to their dock and the store manager tells me it is no problem for me to spend the night where I am. Better, this strip mall place I’m at has a couple restaurants so I may just have a real, honest-to-goodness sit down meal tonight. Yum. The folks offloading the huge (4,000 lbs each) rolls of paper were very efficient and I was heading out about 30 minutes after I touched the dock. I went back to the interstate then north one exit to a T/A truck stop I knew was there, only to find they have a Popeye’s chicken there and it was open! I got some early morning fried chicken… for some reason I’ve been craving Popeye’s chicken recently. Anyway, after an hour or so the word came down that I was to head southwest to Shepherdsville and pick up a two-drop load for the Linens & Things chain. I had dropped an empty at that particular DC before so I knew where it was. My new trailer was preloaded, which is great, and also in the middle of a large puddle of water, which isn’t so great. I managed to hook up to it and get some air to release its brakes then carefully drag it with the gear still down to solid land. It is the little things that really make driving an adventure, I say. So I spent the rest of my driving day cruising over to our terminal in West Memphis, Arkansas where I am calling it a night. The load can’t deliver until Wednesday morning at 0600 at the first stop, so I have an easy 450 miles tomorrow to get into position. Between the deadhead and today’s trip miles, it will be a 1,000 mile trip done in about two days which isn’t bad at all. Last night I shut down at the smallest Pilot with parking that I’ve yet seen… it had about a dozen straight parking spots in the back and that was it. Luckily, I was there early and had my pick. Overnight I tried nursing my batteries by shutting off the truck for three hours then running it for one, then shutting down for another three. It was easily cool enough to shut down (I awoke to 38 degrees outside) but with the problems I’ve been having with starting my truck I didn’t want to take chances. It turns out, waking up every few hours for an hour then trying to get back to sleep doesn’t give me a good night’s sleep, so the truck will be running until I get back to Joplin later this week. Yes, I’m highlighted for the first time in over a month. I’m at the consignee for this load, haven been given the easiest dock they have to back in to… they have 12 docks side-by-side and a lonely 13th dock off to the side, perpendicular to the rest, where I’m parked at with an easy straight back. Yay for me, for a change. High speed internet here too… yum. Turns out the load consists of ten huge rolls of paper product for boxes and such; each is roughly ten feet tall and six feet wide, stacked on their sides.